Carville: "if Jeb Bush loses New Hampshire, it will get Mitt Romney back into the race"
As the New Hampshire primary celebrated its 100th anniversary at the Newseum last evening, political pundit and Democratic consultant, James Carville, forecasted an intriguing scenario within next year’s Republican primaries. 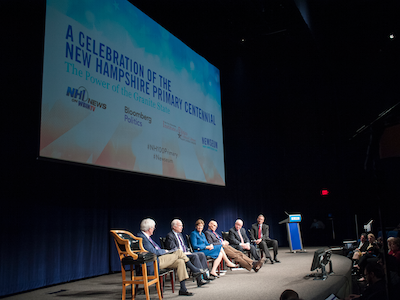 The event, co-sponsored by Bloomberg Politics, Saint Anselm College and WBIN/TV New Hampshire, included a panel discussion on the history and importance of the New Hampshire primary with Senator John McCain, James Carville, Senator Jeanne Shaheen, Tom Rath and Joe McQuaid, and moderated by Bloomberg View’s Al Hunt. “Can anybody be in on that?” McCain responded, a comment that was met with laughter and applause. Some of the notable guests at the centennial celebration included Fmr. Gov. John Sununu, Judy Woodruff, Mark Halperin, John Heilemann, Elisabeth Bumiller, Sen. Kelly Ayotte, Steve Scully, Craig Gordon, Jonathan Allen, Neil Levesque, Gerry McGavick, Rep. Barbara Comstock, Michael C. Bender, Julie Bykowicz, Adrienne Elrod, Tom Johnson, Victoria Clarke, Sen. Lindsey Graham, Michael Callahan, Phil Mattingly, Robert Costa, Mark Leibovich, Jonathan Martin, Betsy Fischer Martin, Gerald F. Seib, Steve McMahon, Alex Castellanos, Stephanie Kotuby, Pat Reap, Julianna Goldman, Don Baptiste, Bernard Shaw, Megan Merritt, Andrea Mitchell, Doug Usher, Sean Spicer, Fred Davis, and Ben Brody.